Great cat bowls can be hard to find. 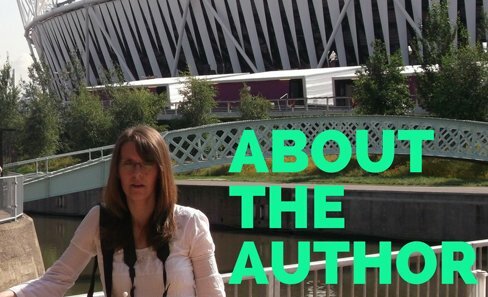 If you are like me, then you have probably bought lots of different types of over the years. You really need something that your cat finds comfortable to eat out of but that also looks attractive in your kitchen. 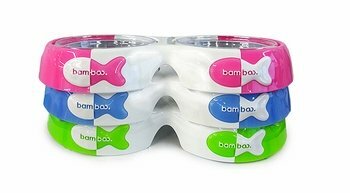 I decided to make a good long search for the best feeding bowls I could find, and I was really excited when I finally found something that seemed to have everything I was looking for! You look after your cat's health by buying them good quality food, so you will want the dish that they eat out of to be hygienic as well. This means that it needs to be made out of a material that is 'food safe' and that is easy to clean. This bowl comes with four replaceble metal inner dishes which fitinside this weaighted plastic base. This means that you can easily remove and clean the dishes ensuring that their is always some fresh food down for your cat. 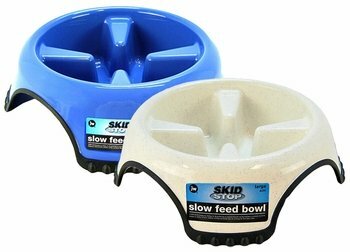 This bowl is great to help those cats who eat their food too fast. This can cause some cats to demand more food and cause weight issues. It can also cause some cats to vomit their food back up after eating. This bowl was design to help slow down the eating process by segrating the food in the bowl meaning that the cat has to navigate their way round the bowl to get to the food. 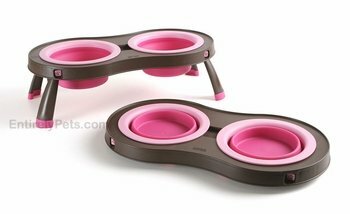 The bowl is also non slip, so that your cat doesn't have to chase thier food bowl around the floor. 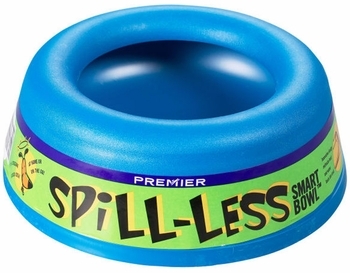 Although designed for dogs this bowl works just as well for cats too. Most cat bowls are simple dishes that lie on the floor. This means that your kitty has to practically lie down to eat. Did you know that cats find it more comfortable to eat their cat food if the dish is raised up to the correct height? This cat bowl is raised up on four legs so that your cat doesn't have to kneel down so far. It is also fully collapsible so it is also perfect for travelling with too. Some cats are messy eaters i know. Food often lands outside the bowl all over the floor. Water too can be splashed everywhere too. This bowl is really amazing it;s design means that food and water are redirected back into the bowl, rather than the floor. All these bowls are very different from each other to suit all different types of cat feeding habits. When choosing your perfect feeding bowl you need to take into account your own cats feeding habits.